Even with a LOT of tinkering during embryonic development, only minor changes could be made in a chick’s skull. Famed paleontologist Dr. Jack Horner, who’s been a consultant on all four films and is the real-life inspiration for Jurassic Park’s dinosaur expert Dr. Alan Grant, believes we’re (optimistically) just five years away from genetically engineering a dinosaur. This article was written back in 2015, so based on Dr. Horner’s optimistic projection, we should be just two years away from having dinosaurs roaming around in some laboratory. There are so many things wrong with that statement, it is hard to know where to start. However, I will give it a try. First, the study to which Dr. Horner refers had nothing to do with genetic engineering. As a result, I have no idea how it could be “proof of concept” that we are going to be able to genetically engineer dinosaurs! What the scientists actually did was manipulate the chemical environment to which developing chick embryos were exposed. They added chemicals that would block the activity of two proteins that they determined were influential in the development of the bird’s facial features, including the beak. They ended up producing embryos whose skulls were deformed compared to normal chick embryos. Second, the changes produced were, in fact, rather minimal. Look at the picture at the top of this post, which comes from the scientific article. 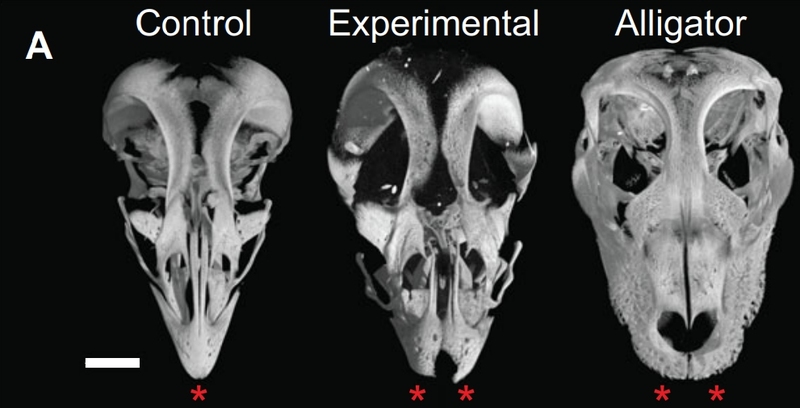 The left skull is of a chick whose chemical environment wasn’t changed. The right skull is of an alligator embryo. The middle skull represents what the research produced. Notice that while the middle skull might be more “alligator like” in some respects, it is still clearly a chick’s skull. Indeed, as the BBC reports, the lead author himself noted that the changes were not all that unusual. So in the end, this “proof of concept” for genetically engineering chickens into dinosaurs couldn’t even produce something stranger than what chicken breeders are producing right now! Third, even if the skull modifications produced by this “proof of concept” experiment were significant, the skull is just one of many differences between birds and dinosaurs. There are lots of structural differences between the two types of creatures, and even if you can produce all the structural changes necessary, they are probably the least important ones. The differences in the biochemistry of birds and dinosaurs are probably huge, and all of that must also be genetically engineered in order to produce an animal that not only looks like a dinosaur but can also survive. Fourth, and probably most importantly, this is all based on the notion that dinosaurs evolved into birds. While this view is all the paleontological rage right now, we don’t really know if it is true. There are a lot of problems with the idea that birds came from dinosaurs, even if you believe in evolution on such a grand scale (I do not). But assuming that dinosaurs did evolve from birds, the idea that you could “reverse” such an evolutionary process is pretty crazy. The mammoth project that I mentioned at the beginning of the article isn’t even trying to do that, and the evolution from mammoth to elephant is significantly easier to fathom than the supposed evolution from dinosaur to bird! So are we just a few years away from genetically engineering a dinosaur? Of course not! In fact, I think that this particular line of research is destined to fail, because it is based on the false notion that dinosaurs evolved into birds. Even if I am wrong about that, however, I can guarantee you that we will have mammoth-like elephants much sooner than dinosaurs, and as I said previously, that’s probably decades away. Anyway, you are correct to estate that is important to don’t follow a(article, news, etc.) media blindly, although generally they are the only ones which reports those scientifics studies without many technical jargons. I rather read the study itself, but sometimes I don’t understand nothing, and this may lead me to jump to wrong conclusions. That is why I like your site! It’s not difficult to digest, and I think your opinion is solid! Producing life in the laboratory from non living matter is only 5 years away, and has been for the last 50 years.